A goal in each half was enough for Rushden to take the points as Melton again struggled to find some home form against a tough uncompromising team. Following their superb win at Blackstones on Wednesday, Town were looking to improve on their opening day reversal against Potton, but were unable to reproduce their midweek form. With Levi Fray injured, young Alex Horobin came in at left-back in an otherwise unchanged Melton team. Play began evenly with both sides struggling to string passes together, but the away defence was never really tested. Both keepers were untroubled in the early stages, but Ash Palfreyman went close with a volley which dipped just over the bar. The visitors hit back and keeper Alex Egner had to move smartly to save a low drive, and after 20 minutes Rushden took a surprise lead. A move down their left ended with a long cross which eluded Egner and Ryan Kalla headed home from close range. Melton tried to respond, but were guilty of many mis-placed passes as the Rushden midfield trio dominated proceedings. With 10 minutes of the half remaining Melton had a gilt-edged chance when Horobin combined with Sam Beaver before sending striker John Love clear. But the striker screwed his shot wide with the keeper stranded. Chances were few and far between and the visitors were quite happy to clear their lines whenever Melton threatened. 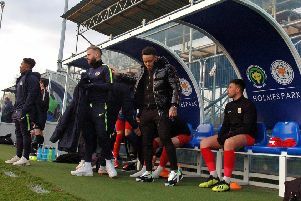 The second half continued in the same vein and even the first appearance of the season of substitute Jack Baker was unable to add the missing spark. With time running out the hosts won a succession of free-kicks against rugged tackling. But despite centre-half Kieran Clayton twice outjumping the keeper, Melton couldn’t force an equaliser. From another free-kick, Palfreyman then fired narrowly past the post with the keeper beaten. And Town were punished as the visitors notched the all-important second goal, when a free-kick from the right was again headed in from close range by Kalla. Manager Tony Thorpe described the opposition as well-organised and professional and there will be no room for complacency following the club’s successes in the Senior League over the past few seasons. The new league is challenging and Melton will need to adjust quickly to sustain a challenge. Town: A. Egner, S. Beaver, L. Fray. K. Clayton, A. Horobin, L. Mann, J. Baker, D. Taylor, A. Gentleman, A. Bishop, S. Myring, A. Palfreyman, J. Love, B. Lapworth. Matchball Sponsors: My Guy Clothing.